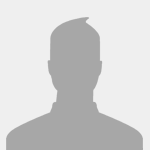 Does Bear Island work if you are using an agenda besides the Siege of Winterfell? Or is this not the case given that according to the FAQ, they "are not to be considered in play"? No agendas have a house affiliation. Agendas do not count because they are out of the play area. ummm...SICK SICK card. Def gonna add this to my stark deck, 3 gold, basically 95% of my deck is stark affiliation, so this is almost a must. The problem is, I might have to run that plot that allows both players to search for a loc (not a big fan of plots that help other players ), cause this card pretty much should be played almost w/ in the first or second round. What stark or neutral loc can stand this loc if possible? 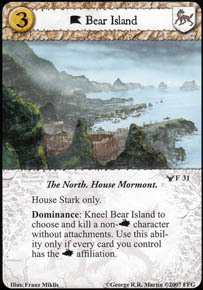 If you did have a neutral location, or any other neutral card in fact, you wouldn't be able to use Bear Island as every card you control would not be House Stark. Personally, whilst the effect is powerful, I find that not being able to use any neutral card is too punishing. No Street of Steel, no Flea Bottom, not even a Rusted Sword or Maester Aemon. Plus, with the cost of 3, it would get targetted by Newly Made Lord or Search and Detain, to prevent you killing off their characters. additionally you cannot even have chains in your deck for this to work. Steel Link (TIoR) as an example could stand it but it would also prevent bear island from working. Yea it is a powerfull effect, but like NuFenix said, it comes at a fairly high price. If you have any non-stark card in play then you can't use this card. You would want a 100% stark deck (events don't count) because otherwise any non-stark card would be dead draw as long as you wanted to use Bear Island. After being on the receiving end of this recently, and due to House of Dreams (ARotD) being printed, I now feel this card is TOO good. With the new multi-faction Kingdom reducers, and the card pool expanding, being able to use only Stark cards, and thus every turn pointing at your opponent's most annoying character without attachments and kill them off is so amazingly powerful, with options to deal with it so few and far between. Bear Island is good, but if it starts dominating the scene just toss a couple of attachments in your deck. No need to restrict it. Don't know about HoD, but I want to give this old card second chance in Maege Mormont (AHM) + Rickon Stark (MotA) deck. Limited recource location won't be that much of a problem, there are other downsides of course, but overall I think that it will give me more flexibility than HoD. I shall find out. You can not effectively run carrion birds so both winter and summer decks have a large advantage on you. I am assuming you cannot run any attachments such as White Raven (TWoW) as it will make Bear Island (AE) unusable? Does bear island work if i have Brianne on my deck? Yes, because she still has the Stark affiliation. It works so long as each card has the Stark affiliation, and doesn't stop working just because you happen to have another affiliation as well - so Narrow Sea (Core), Ser Jorah Mormont (PotS), etc. all work fine. Okey good to know. Just made this bear island deck. Including all those three. This is a good question. If it is attached to your house card is it still considered in play? Yes it is, the house card is in play. Also attachments on out of play cards are still considered to be in play. card in play that is considered to be "attached"
So, yeah, the card is in play and in your control, so it negates your chance to use the Bear Island ability. So... if you use "they shall not cross" to save Bear Island, then enters game as a neutral boon attachment... (no choice on the matter) so you cant use Bear Island anymore anyway??? They Shall Not Cross is House Stark only, so presumably when it enters play as an attachment it wouldn't interfere with Bear Island's text conditions. But then 'House X only' is a deck-building restriction which I'm not sure counts as House affiliation, so I could be wrong.